I hope everyone had a successful stitch and hermit weekend! I managed to have a decent one. I did go out on Friday night to a friend's art show opening, which was a lot of fun. It's always good to see all her friends and family come out and support her. Yay for the arts!! Luckily I didn't have any plans for the rest of the weekend, so I got to set up my stitching station and go to it. While I was stitching, I decided to pop in the first two extended movies of the Lord of The Rings. I felt it was that time of year to take a trip to the Shire and travel with the fellowship. I didn't really get to 'watch' the films because I was focused on my Haed piece. It was sort of like radio! A lot of my time on Saturday was spent trying to figure out a mistake I made in the TBF pattern. Sigh...did that take an age to work it out. I had to quickly make little 10 x 10 blocks with thread and count and recount a rather big section. Luckily, the mistake was a small one that I stopped from following me around the pattern. I didn't frog it, since frogging 1 over 1 is not a good idea, so I worked with it instead of fighting it!! Thanks to all those who gave me tips on whether to wash now or later, and I think the general consensus is to wait till the end. I did test wash a piece of the evenweave and I noticed that the fabby sort of shrunk a bit which means if I wash now, my piece will be distorted. I will also be adding some fabric bits under my Qsnaps so I won't soil the fabric as much as before. As planned, I started a new Christmas ornament!! 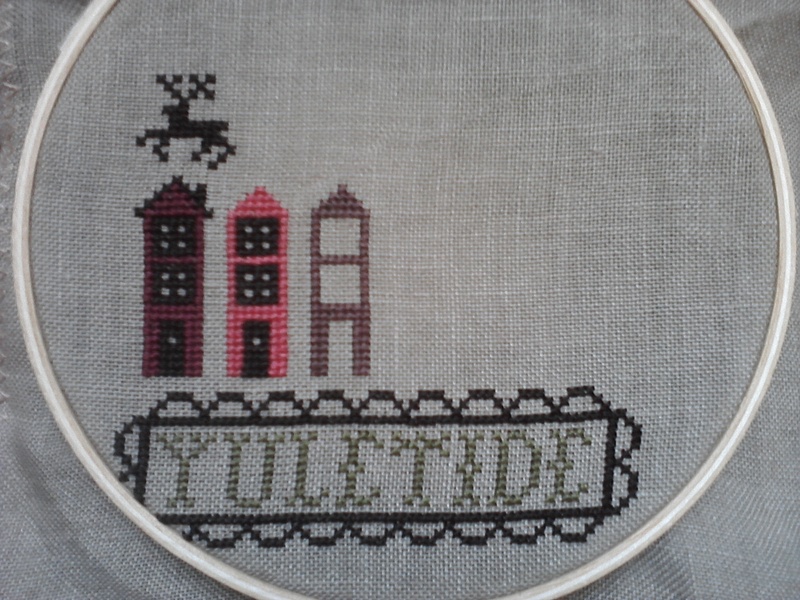 I chose "Yuletide" by Plum Street Samplers because I had the threads already! I used a different fabric than suggested though and I think I like my choice better. It is a khaki colour, unknown count, although I think that it must be 36 ct or 40ct. It comes from my wonderful friend who gifted me with all her fabbies that she will never use! So thanks again dear friend!! To finish off this post, I am happy to say that I found the perfect fabric for Valerie's pin cushion and have begun the process of putting it together. I won't share any photos of the cushion though until she gets her package. 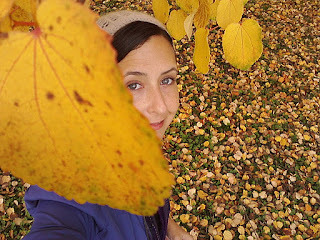 Here's a couple of fall photos I took of me and my hubby's walk around a park on a beautiful crisp, autumn day! Take care and happy stitching!! i so much love the tea cup fairy..great progress..well done. lovely autumn picture,,i love autumn so much..
Great progress on your teacup fairy. Just love the sparkle and good that you found your error and it wasn't too big a deal. The start on the ornie is adorbs! I need to stitch this one...along with a ton of other things! 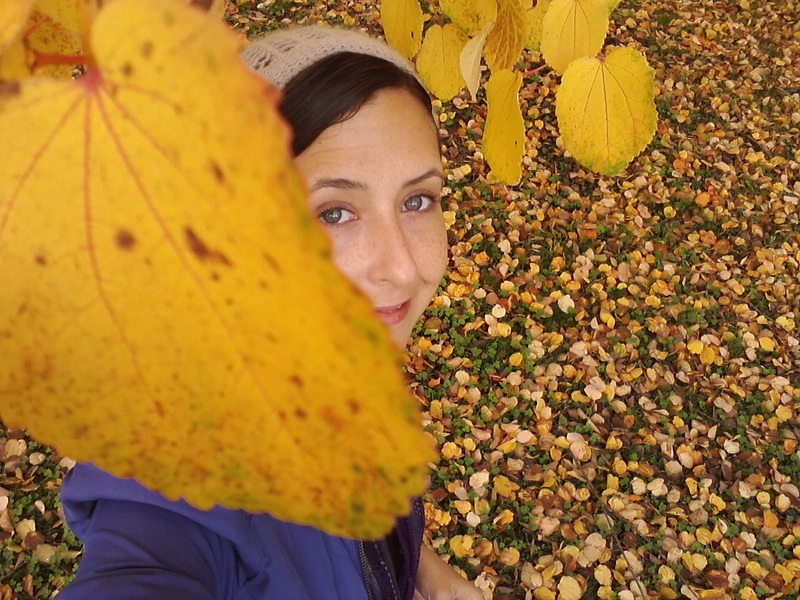 Love the autumn photos! You're so lucky to have changing leaf colors. We don't get that here! A woman after my own heart --- work with the mistakes and make them into design elements! For me, that would be the only way a giant piece like that would ever stand a chance! 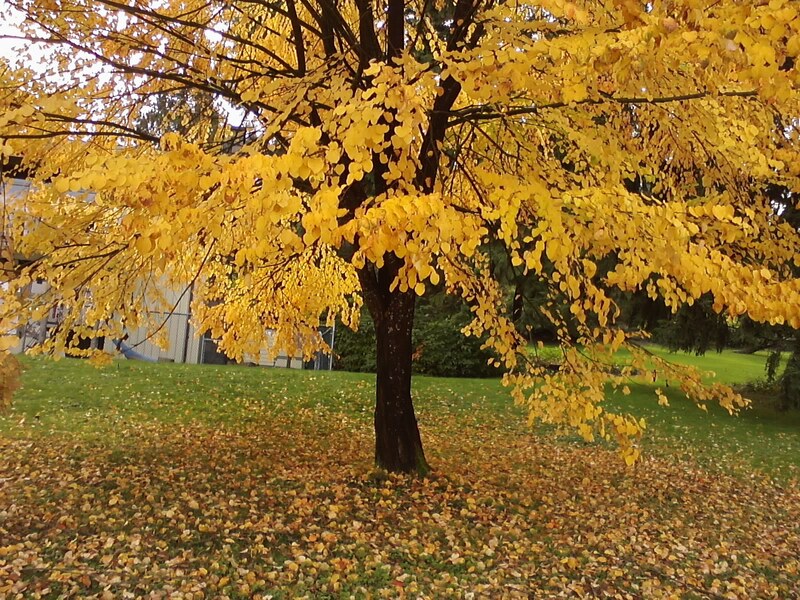 Love your pretty fall photos! Nice progress on the teacup fairy. Luckily it is quite easy to work around mistakes in HAEDs: I have made at least three mistakes in my Fairy Wishing Well, and they are totally invisible among the thousands of stitches that are in it! So as long as you catch the mistakes early, it won't be necessary to undo them. :) Good luck with the rest of the project! And your Haed is growing well! The HAED is looking good, and I think the fabric change you made was a good one. I'm really enjoying that teacup sparkle! Ohm, that ornie is one of my favorites this year! So pretty! Your HAED is looking good too! Love LOTR! Glad your small "design change" won't make a huge difference, she is coming up beautifully. I just love Autumn, the colours are spectacular. Thank you for sharing! What beautiful autumn pictures, Anne. That ornie is going to be so cute and the teacup fairy... love the sparklies. Great job!! Your HAED looks like it's coming along well! I always work around my mistakes if I can, especially if I find them later and frogging would require too much ripping out. My mother is visiting (which is why I am late with commenting on both this post & missed your last post all together!) and chats nonstop. I love her dearly and am thrilled with the company and trying to embrace the chatty but I have been working steadily along on a sampler & we'll just say that some parts of it are going to be my own adaptation of the design. LOL I never wash my pieces since I always have an overdyed something or other, but agree with what others said--wash at the end! Love your ornament progress! I need to get going on mine. Yikes! Both of those look like they were fun to work on! Good luck continuing, and congrats on all of your progress- also, your area looks remarkably picturesque! Ripping out one over one is not a good idea, glad you found away around it, I do the same thing. What cute WIPs you have! Can't wait to see more progress. Love the photos of you on your walk. I love this time of year! Never seen the Tea Fairy before,she's very pretty and a little bit saucy looking.Love it. 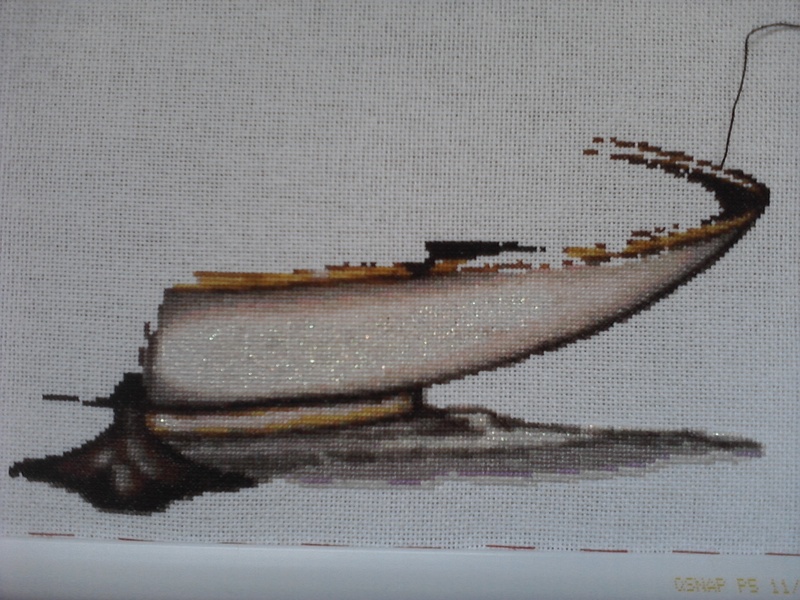 :).Love the sparkly thread in the saucer, its starting to take shape now. Nice start on the Plum Street one. Great progress on your HAED - glad that you could work around the mistake. Much better than frogging. Autumn is my favourite season - so I love the pics of your walk in the park. Helloooooo, darling!!! I made it!! and before the weekend. LOL!!! Glad you didn't have to frog. I always take the lazy way out and work with the mistakes, unless it's a huge mistake like a horn growing out of a bum... LOL! Love your little ornie, can't wait to see it finish. Your teacup Fairy progress is beautiful! I can't wait to see your next update. Your ornament is so pretty. Love your pics, the colors are amazing!! Teacup Fairy is really coming along! I often listen to the TV rather than watch anything while I'm stitching. It's safer that way! I love your new start. Aren't her designs fun to stitch? Hi Anne, thanks for leaving such a lovely comment on my blog. I did have a lovely day out with my friend and I hope you did too. I can sometimes stitch things quickly, but some designs seem to last forever! 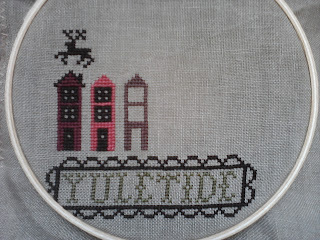 Yuletide is looking wonderful, keep up the fab stitching. Fabric Shopping, Fibers, Finishes and Fall! !